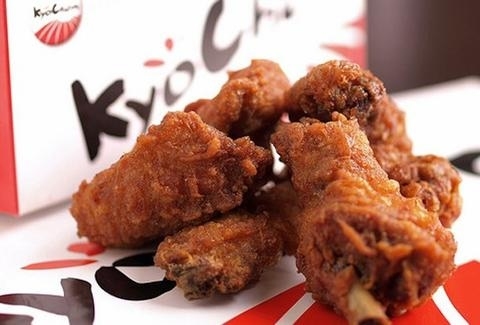 his Korean mini chain specializes in fried chicken like you've never tasted before. The simple numbered menu features a fried whole chicken, rice bowls, and salad (both topped with chicken, of course), but you're really there for the mind-blowing wings, all of which are double-fried in canola oil. Pour oil into a 6-qt. pot to a depth of 2 inches. Heat over medium-high heat until a thermometer reads 350˚. Chop garlic and ginger in a food processor. Add soy, gojujang, vinegar, sesame oil, and honey; puree. Put sauce into a bowl. Whisk flour, cornstarch, and 2⁄3 cup water in another bowl. Add chicken; toss. Working in 3 batches, fry chicken until golden, 6–8 minutes. Drain on paper towels. Return oil to 350˚. Fry chicken until crisp, 6–8 minutes more. Drain again. Toss chicken in sauce.